After her marriage to a wealthy businessman (Alec Baldwin) collapses, New York socialite Jasmine (Cate Blanchett) flees to San Francisco and the modest apartment of her sister, Ginger (Sally Hawkins). Although she's in a fragile emotional state and lacks job skills, Jasmine still manages to voice her disapproval of Ginger's boyfriend, Chili (Bobby Cannavale). Jasmine begrudgingly takes a job in a dentist's office, while Ginger begins dating a man (Louis C.K.) who's a step up from Chili. "Blue Jasmine": Woody Allen Turns a New Yorker Loose in S.F. "I used to know the words. Now it's all a jumble," Jasmine says of her current state in life. She may as well be reciting her own epitaph. 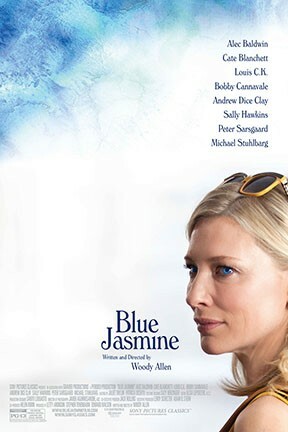 — By Glenn Heath Jr.
Blue Jasmine is not showing in any theaters in the area.